Back in 1997, Gran Turismo proved that racing simulations could not only be popular, but a huge selling point for a system. Since then, Polyphony Digital’s driving series has become a PlayStation staple, and with Gran Turismo Sport, the series is finally coming to PlayStation 4. This marks a lot of firsts for the series, as it offers up (really great) HDR and 4K support, and is even playable in virtual reality. It’s undeniably a technical marvel, but is there enough here to make this a compelling overall package? The first thing players will want to do is go into the game’s Driving School. Even if you’re an experienced digital driver, you’ll still want to go to class to get several cars and valuable in-game currency as a reward for going through its tutorial lessons. These missions start off extremely simple (the first one is cleared by literally pressing the accelerator), but they quickly become more complex as players have to make hairpin turns and watch out for oversteering. It’s a great way for players to really appreciate how much depth there is to GT Sport‘s driving, which is just as satisfying as it has always been. As far as gameplay goes, GT Sport plays just as well as its best competitors. Additionally, there’s a separate mode that allows players to learn each course and their individual sections. If you want to truly master driving then you’ll find all the tools you need at your disposal. When I finished the driving school, I wasn’t compelled to replay a bunch of tutorials in order to better my times (you can get gold medals and so on depending on how you perform). That meant I went into its Mission Challenge mode, which is the closest thing there is to a Gran Turismo Sport career mode. Anyone expecting a lengthy in-depth career mode like Forza Motorsport or Project CARS 2 will be heavily disappointed, as it’s a pretty stripped down series of 64 events. Many of the early ones aren’t even races, but simple challenges like trying to knock over some pylons or reaching a certain speed. Eventually, things get more intense (for example, you’ll have to start pitting later on while doing longer races), but it’s a really underwhelming career mode with little pizazz in terms of presentation. If you’re one to be compelled by needing to get gold medals then you’ll find some reasons to come back to it, but even then it’s not a lengthy affair. Finally, there’s an Arcade mode which is probably where solo players will spend most of their time since the campaign offerings are so underwhelming. It’s here where players can set up single races, time and drift trials, custom races, and do split-screen multiplayer. That may seem like a lot of options, but not being able to do something as simple as creating a set of races in order to do a championship series is a real bummer. Even Mario Kart 8 has more compelling solo content than GT Sport, and Sony should be doing better than that in 2017. The museum is low-key one of the coolest features of GT Sport. Rather than having the full game playable in virtual reality, the GT Sport VR experience is split into two separate modes: VR Driving and VR Showroom. I’ll start with the latter, which is really an awfully tacked-on mode that allows the player to walk around the beautiful cars. Driveclub VR had a similar mode, but this is even more limited as players can’t get inside the cars of their dreams in VR. It’s way too limited to be of any value, and it’s really too bad since I enjoyed the same gimmickry in Driveclub. Thankfully, the VR Driving makes up for the other mode being a disappointment. Playing Gran Turismo Sport in virtual reality feels amazing. Actually feeling like you’re inside these top-notch vehicles is an awesome accomplishment, and it adds a lot of strategy in having to actually watch your mirrors while driving. It really adds so much to the experience, and while there’s a definite knock in resolution, it looks much better than Driveclub VR. Sadly, the mode is super bare bones (several options such as certain time conditions can’t be picked), and you can only race against one other car on the tracks. It makes an incredible first impression, and then I was left wondering why I booted up the mode since there wasn’t much to actually do in it. Gran Turismo Sport could’ve easily had been one of PlayStation VR’s killer apps. The racing feels that good while wearing the headset, and unfortunately with the way it’s packaged, it’s turned into a throwaway mode that you’ll occasionally use or show friends, but that’s it. There’s no real replayability, no proper structure, and nothing to keep players from coming back. As far as entertainment goes, it’s an absolute tragedy that it’s been undersold rather than been fleshed out further. Since both the campaign and virtual reality offerings were underwhelming, a lot was riding on Gran Turismo Sport‘s online modes. This clearly has been a focus during development—after all, the Sport mode shares the name with this entry’s subtitle—and I was excited to test my skills against others. Before players get into an online race, they have to watch some videos on racing etiquette. The game makes it very clear early on that this is a serious competition, and any tomfoolery will be punished. As such, players are assigned both a Driver and Safety Rating. The most exciting part of the online mode won’t actually be in the game until November, as none of the different Cups are active yet. In theory, players will be able to compete online in actual competitions, and a competitive circuit will arise out of it. It’s a promising idea, but right now it’s just that, an idea. When these bigger events aren’t happening, players only have three daily races that they can try out. These events run at 20-minute intervals, but that isn’t much of a problem as you’ll want to get some practice laps in before actually competing anyhow. The online racing works great, as I had zero issues with netcode. As an added bonus, Polyphony Digital intelligently ghosts out racers who spin out, thus ensuring safe drivers won’t get punished for being at the wrong spot at the wrong time (although crashes will inevitably happen). Currently, the Sport mode is more of a proof-of-concept than anything. If players want to compete online in something other than the three designated races that are currently going on, they’ll have to jump into the lobby system, which allows players to join and create rooms with up to 16 players. The user interface here isn’t optimal, although there are some smart sorting options in place, and it’d be nice to be able to just do some matchmaking in order for there to be more rooms that were close to being full. For a game that is seemingly focused around competition, Polyphony Digital hasn’t really gone all out in terms of multiplayer features (although there is a sort of great, yet really dumb in-game social network). There is one mode that really blew me away, and that’s the museum hidden within the game’s Brand Central mode, which is also where players buy cars. 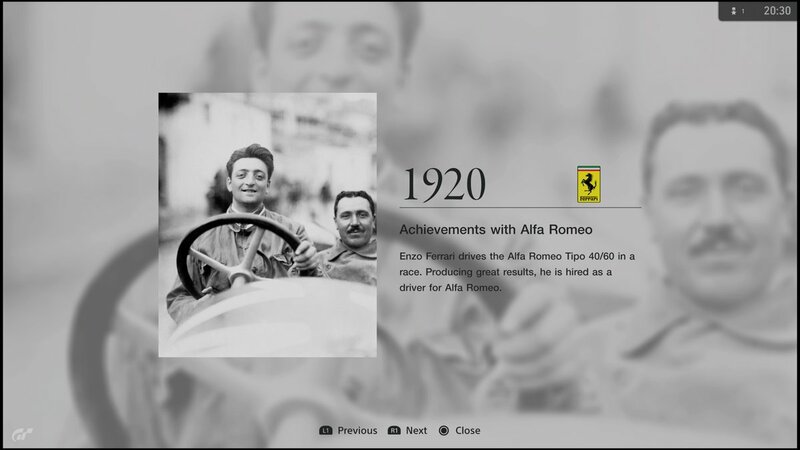 While not every brand of vehicle has been given the full treatment, companies like Ferrari and Ford have had their history recapped in a handy slideshow with a ton of pictures and information. I spent over 10 minutes reading about how Ferrari evolved over the years, and it was truly fascinating. It’s great getting to learn more about these vehicles, and the people behind them. 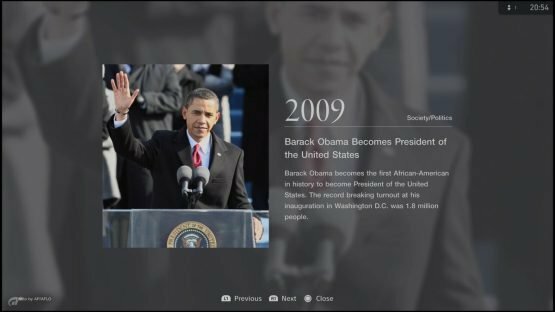 Additionally, a bunch of world events are also seen on a separate timeline, that way players can get a full view of what the world was like while these vehicle milestones occurred. It’s definitely one of the best additions to GT Sport, and like most of the game, I wish it was fleshed out a bit further. It’d be really nice to include all of the brands, even if not all of them have histories as deep as the aforementioned manufacturers. One’s enjoyment of Gran Turismo Sport will solely be determined by whether the prospect of learning different tracks and competing in three different online races per day is exciting to them. If you can’t get into that gameplay loop then you’ll want to play something else, as the single-player content is extremely limited, and even the online offerings aren’t rich with features. GT Sport does a few things exceptionally well (you won’t find a better looking and playing racing game), but it ultimately left me wanting more content out of it. Hopefully over time, either through updates or DLC, the size and scope of it will be expanded, but for now players can enjoy some incredible racing, even if it’s quite limited. Gran Turismo Sport review code provided by publisher. Version 1.02 reviewed on PlayStation 4 Pro. For more information on scoring, please read our Review Policy here.